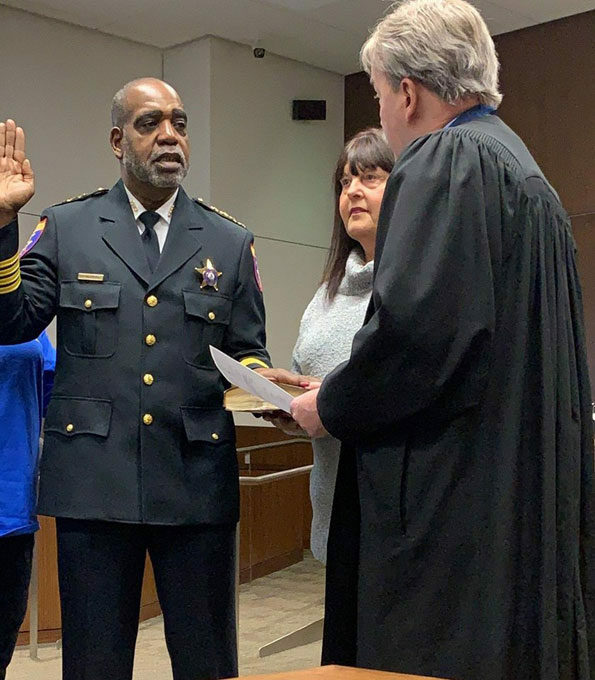 On Saturday morning December 1, 2018, John Idleburg was sworn-in as Sheriff of Lake County. Chief Judge Ukena swore-in Sheriff Idleburg at a private ceremony held at the Lake County Courthouse. According to the Lake County Sheriff’s Office, Sheriff Idleburg is a service-driven individual. Idleburg previously served in the United States Marine Corps and then served for over 30 years as a law-enforcement officer both at local and federal levels. He brings a wealth of professional community service experience to lead the Lake County Sheriff’s Office. Lake County Sheriff John Idleburg swearing in at private ceremony. 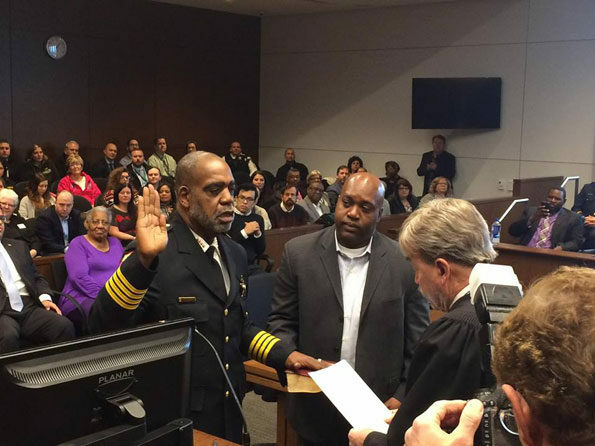 A ceremonial swearing-in was held Monday, December 3rd, at 8:00AM in Ceremonial Courtroom T810. 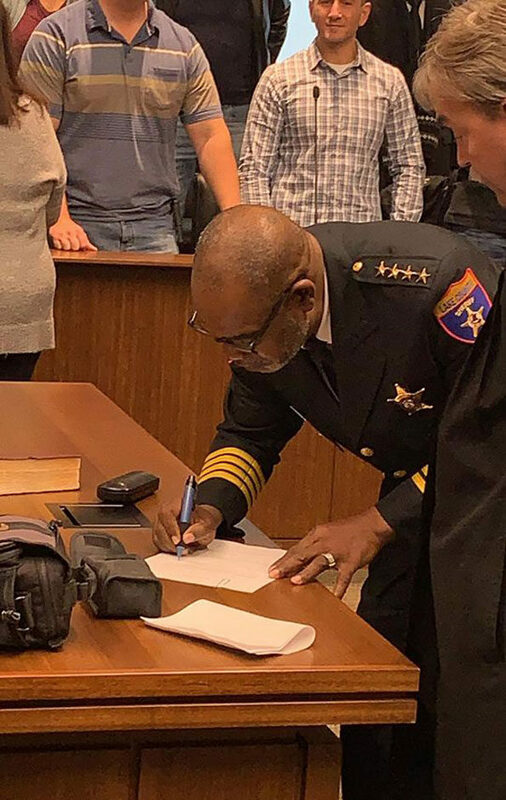 The ceremonial swearing-in was open to the public with family, friends, and members of the Lake County Sheriff’s Office there for the ceremony. Most recently Sheriff John Idleburg worked for the Lake County Forest Preserve, Zion Park Police and Lake Forest Hospital after retiring from three decades of service in federal law enforcement. His assignments included Special Investigator with the U.S. Department of Defense, Special Agent for the U.S. Treasury Department, and personal security for then-First Lady Hillary Clinton and Tipper Gore at the Democratic National Convention in 1996. Idleburg also provided security for foreign dignitaries at the United Nations and Winter Olympics in Salt Lake City in 2002. Prior to working in federal law enforcement, Idleburg worked as a Lake County Sheriff’s Office Deputy in the Work Release Camp in Zion, and as a police officer and detective with the Great Lakes Police Department. Idleburg has served as Post Commander for the American Legion Zion Post 865 for 4 years. Currently, he is the President of the Illinois Police Association; Commissioner for the Police and Fire Commission, Zion, Illinois; and Commissioner for the Lake County Housing Authority. Idleburg replaced three-term incumbent Mark Curran, who was leading by just over 750 votes on election night, but who lost by 137 votes with the final tally of of 245,633 votes (Idleburg 50.03% to Curran’s 49.97%). After the mail-in and provisional votes added 6,166 votes, the tally was 254,217 votes, amounting to 56.7 percent of Lake County’s 448,295 registered voters. Three countywide offices — sheriff, treasurer and clerk — involved incumbent Republicans unseated. Lake Sheriff John Idleburg at public ceremony Monday morning.